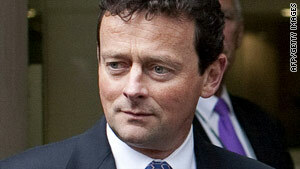 Outgoing BP Chief Executive Officer Tony Hayward on Tuesday defends his record on safety. (CNN) -- Outgoing BP Chief Executive Officer Tony Hayward declared Tuesday that the Gulf of Mexico oil well disaster represents a failure for the entire deepwater oil and gas drilling industry, not just for BP alone. "The industry needs to re-evaluate safety," Hayward told investment professionals in a webcast. His comments came after the BP board decided to replace him October 1 with Robert Dudley, the head of the company's Gulf cleanup effort. "Everyone will re-evaluate the business model to reduce risk associated with deepwater drilling," Hayward added. BP maintains that it alone does not deserve all the blame for the April 20 accident and its aftermath, and it intends to pursue legal action to have drilling partners share in the cost of containment and cleanup. Those partners include Transocean, which operated the rig; Cameron, which built the blowout preventer that failed to shut down the well; and Halliburton, which cemented the oil drill into place underwater. "It is clear the accident was the result of multiple equipment errors and human error involving many companies," Hayward said in the webcast. The project's contracts include arbitration clauses and BP said it will first approach the issue through that legal avenue. Hayward also defended his record on safety. "Safety, people and performance have been my watchwords," he said. "We've made significant progress." The BP CEO, who became the corporate face of the Deepwater disaster had, during his three years at the helm of the British-based oil giant, often spoken of BP's improved safety record since the 2006 Prudhoe Bay, Alaska, oil spill and the 2005 Texas City, Texas, refinery fire that killed 15 people, which occurred before he took over the company in 2007. "From the beginning of the crisis, I've sought to do the right thing, do it the right way and communicate openly," said Hayward. "I believe BP has shown what corporate responsibility really means and I believe that applies to individuals as well as companies," he said. Eleven workers died when the Deepwater Horizon rig exploded and sank in the Gulf of Mexico. From that time until July 15 -- when a cap was sealed over the ruptured well head -- oil spewed into the Gulf at the rate of tens of thousands of barrels a day.